Length: 41 hrs. 3 min. NOW INCLUDING ISAIAH: THE VISION IN ADDITION TO PSALMS, PROVERBS, AND SONG OF SONGS. The Passion Translation Bible expresses God’s fiery heart of love to this generation using Hebrew, Greek, and Aramaic manuscripts—merging the emotion and life-changing truth of God’s Word. Now, the Passion Translation New Testament contains not only the ENTIRE New Testament, but also Psalms, Proverbs, Song of Songs, and the newly released Isaiah: The Vision. 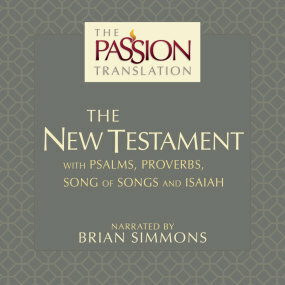 UPGRADE PRICING: If you previously purchased The Passion Translation, New Testament Audio, we are able to provide the new version including Isaiah for a special upgrade price. The upgrade pricing will be visible when you log in to your Olive Tree account and add the item to your cart (NOTE: this special upgrade pricing is only available on olivetree.com, and not via in-app purchase). Dr. Brian Simmons is known as a passionate lover of God. After a dramatic conversion to Christ, Brian knew that God was calling him to go to the unreached people of the world and present the gospel of God’s grace to all who would listen. With his wife Candice and their three children, he spent nearly eight years in the tropical rain forest of the Darien Province of Panama as a church planter, translator, and consultant. Brian was involved in the Paya-Kuna New Testament translation project and studied linguistics and Bible translation principles with New Tribes Mission. Brian is now working to complete a new translation of the Scripture from the ancient Hebrew, Aramaic, and Greek.